How does Tony Robbins maintain his energy? This is a common question asked by awed Tony Robbins fans — and, I imagine, by awed Tony Robbins skeptics as well. No doubt, Tony Robbins is an impressive public figure, objectively speaking. Whether or not you’re into the whole self-help entrepreneur appeal of Tony, it’d be foolish to disregard his energy and professional stamina as a “gimmick” or shtick. And so it’s with special interest that I approach this Energy Now review. After all, Tony Robbins has a reputation to keep, right? So, he wouldn’t just throw his name on any ol’ energy supplement, right? Let’s read the Energy Now review to find out. Conclusion: Does Energy Now Work? 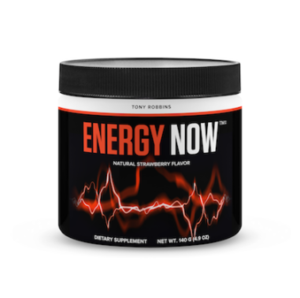 Tony Robbins Energy Now is a natural energy booster and stimulant supplement designed for pre-workout exercise performance and workday energy stamina. PEAK ATP® and Creatine MagnaPower® supply long-lasting stamina benefits that, while not stimulating per se, may significantly improve exercise results and recovery. Cellular Energy and Stimulation: by supplying both natural cellular energy (ATP and creatine) and synthetic stimulation (via caffeine) Energy Now covers both short- and long-term energy enhancement. Other Ingredients: Natural flavor, citric acid, stevia leaf extract. Directions: As a dietary supplement, mix 7 grams (approx. two teaspoons) in eight ounces of water and consume 30-45 minutes before a workout, or as directed by your health care practitioner. via Robbins Research International, Inc.
One part pre-workout performance enhancer, another part nootropic energy booster. 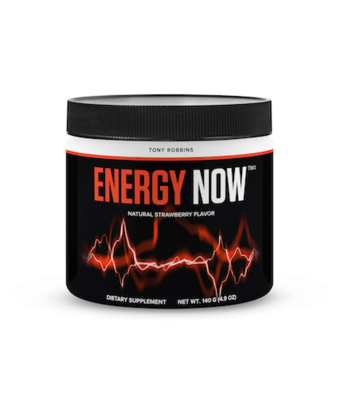 Energy Now has the energy boosts, but in both nootropic and non-nootropic forms. Let’s check out those forms in the following guide on Energy Now’s formula profile. Magnesium (from Creatine MagnaPower®) – Accompanying Energy Now’s creatine content via the MagnaPower® brand, magnesium is a smart choice for various metabolic reasons — let’s just say it’s great for general health and wellbeing. Personally, I turn to magnesium to replenish my mineral levels following intense exercise, to get better sleep, and to restore my thinking following an intensely fun, mind-altering weekend. Acetyl L-Carnitine HCl – Hugely popular amino in nootropic supplements, ALCAR seems to work by helping transport fatty acids to mitochondria for ATP energy production. The idea: burning fat for energy, a metabolic benefit of particular interest to bodybuilders. More on ALCAR. Creatine may help increase muscle mass, strength, and exercise performance. N-Acetyl-L-Tyrosine – Every morning I add L-theanine to my coffee (see “L-Theanine” below), and every now and then I add NALT, namely when I wake up groggy and tired after a long night. L-tyrosine converts to catecholamine neurotransmitters, sustaining mood and motivation under conditions of stress, fatigue, and over-activity. More on NALT. PEAK ATP® (Adenosine 5′-Triphosphate Disodium) – Clinically studied, patented form of Adenosine 5′-Triphosphate (ATP), the body’s primary source of cellular energy. Supplementing ATP may help athletes maintain high ATP levels for extended muscular stamina and activity, as well as improve post-workout recovery. L-Theanine – None of the “energy boosters” listed above require a calming, anxiolytic, such as L-theanine, to reduce any jittery side effects. However, Energy Now smartly employs this nootropic to complement the next ingredient’s stimulant effects. I find the L-theanine + caffeine duo effective at improving both mental and physical performance. More on L-Theanine. Caffeine (from green coffee) – You know what it is: caffeine, the world’s favorite stimulant drug, stimulates energy and focus. Yet, in high doses, caffeine may actually impair cognitive performance. Fortunately, L-theanine helps ameliorate the negative effects of caffeine. More on Caffeine. Cellular Energy – increases in ATP and creatine energy, increasing the “fuel” reserve for muscular and mental stamina. Stimulation – straight-up caffeinated energy and focus boosts for synthetic performance enhancement. Typically, I’m not into the stimulation route towards energy boosting. Fortunately, Energy Now places a larger emphasis on cellular energy (ATP and creatine) over stimulation — and even the stimulation isn’t all that jarring. Most of us are pretty damn familiar with caffeine, and this modest 100 mg amount won’t have us running up the walls. What’s more, Energy Now smartly pairs its caffeine content with L-theanine, an awesome stimulant complement that sustains the energy and focus benefits of caffeine while trimming off any excess “jittery” side effects. By supplying ATP and creatine, Energy Now qualifies as an effective pre-workout supplement. However, big-time exercisers may feel it’s lacking in other performance enhancing compounds, such as N.O. boosters and stress-reducing adaptogens (with exception to NALT). Even so, for the highly active worker, Energy Now’s benefits are great, giving you the right amount of the right type of energy to keep you fresh throughout the day. It is a bit pricey; however, if you can afford it, stacking Energy Now with “muscle pump” supplement may help round out a solid, comprehensive, “smart energy” PWO stack. Or if your goals primarily relate to increasing mental performance, consider stacking Energy Now with a cholinergic nootropic formula. More on Nootropics for Brain Energy. Energy Now places a greater emphasis on cellular energy over stimulation, supplying a smart, healthier source of daily workout and work stamina enhancement. The ingredients come in high quality forms and sufficient dosages; the “Other Ingredients” are clean for a powder supplement. Caffeine is forgivable in a nootropic brain health supplement, if it’s paired with L-theanine. While Energy Now isn’t exactly a nootropic brain health supplement, it handles its caffeine the proper, nootropic way. Energy Now is an expensive supplement. You may find a comparable pre-workout stack for quite a bit cheaper than this. Creatine is somewhat dehydrating, if you’re not: A) sufficiently burning it off via exercise, and B) drinking enough water. On the Tony Robbins online store, Energy Now sells at the above listed price for single order purchases. Or you may buy Energy Now at a 34.78% discount (+ free shipping), if you choose the “Ship every 30 Days” auto delivery order option. Not a bad idea for the long-term Energy Now customers. Energy Now primarily advertises itself as a pre-workout supplement, appealing to athletes and bodybuilders. The “mind sharpening” aspect may improve mental performance in non-exercise measures; yet, I’d recommend Energy Now as part of an exercise routine, one active enough to sufficiently take advantage of the creatine energy boost. You can buy Energy Now through the Tony Robbins website. As far as I know, this is the only location to buy Energy Now. No Amazon listing — sorry, Prime members. Energy Now is a smart energy formula, opting for actual natural energy enhancement rather than “jittery” amounts of cheap caffeine. Many energy formulas go the stimulant route, supplying a semi-addictive amount of feel-good, brain-jolting energy that’s neither healthy nor nootropic. However, Energy Now takes the more effective cellular energy path to better mental and physical energy performance. Granted, it’s not the most comprehensive formula, missing out on muscle pump boosters and cholinergic brain enhancers. Yet, it’s a great supplement for boosting stamina, worth adding to either your pre-workout and/or nootropic brain health stack. For more stack options that may pair well with Energy Now, check out my Best Nootropic Supplements of 2018 list.